Roofers specializing in Flat Roof Installation, Flat Roof Repair, Roof Leaks, and all other Flat Roof Installation Services in CT. Call 1-888-766-3020 for a Free Quote today! Throughout Connecticut, we provide a full line of commercial roofing services with flat roof installation being one of our many specialties. Our Licensed and Insured commercial roof contractors have been installing and servicing all types of flat roofing systems like EPDM Thermoset Membrane, PVC Thermoplastic Membrane, Modified Bitumen, Asphalt Built-Up Roof (BUR), TPO Thermoplastic Membrane, and CSPE (Hypalon) Thermoset Membrane. If you’re looking for a reputable roofing company to install a new flat roof or repair your current commercial building roof, then contact New Roof Connecticut at 1-888-766-3020 or request a Free Commercial Flat Roof Quote. 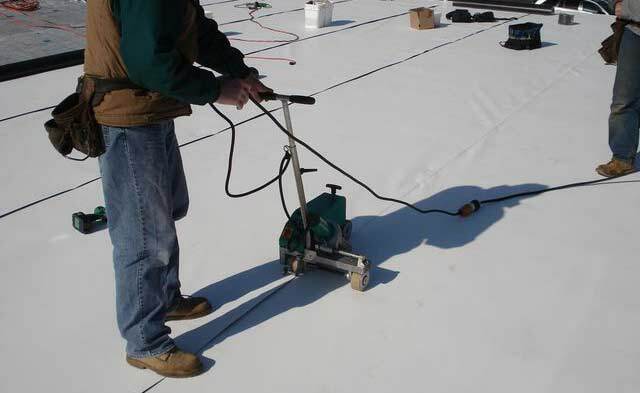 Our commercial flat roofing contractors service New Haven, Fairfield, Hartford, Middlesex, New London, Tolland, Windham and Litchfield County on all types of flat roofs and buildings. Flat Roofing systems are horizontal roofs constructed with a slight incline, typically about 10 degrees. Flat roofs are built with a slight incline to prevent water accumulation called "ponding" which leads to roof leaks. Advantages of Flat Roof Installation over sloped roofing are: better cost efficiency, lower installation costs, and easier accessibility. 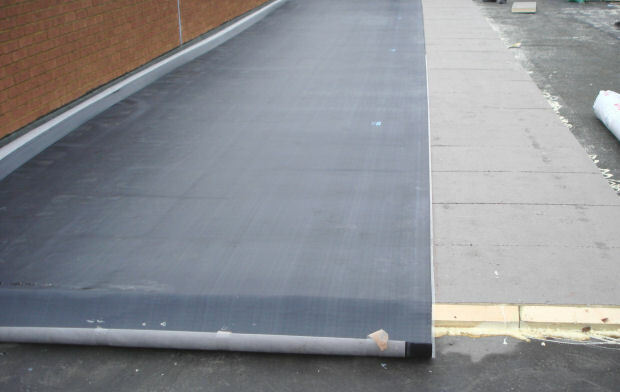 Disadvantages of Flat Roof Installation include: not suitable for all building types, have higher maintenance than sloped roofs, and roof coatings are not as durable. If you’re looking to install a new flat roof or if you need roof maintenance, roof construction, re-roofing, roof repairs, waterproofing, or preventative maintenance for your building then we can help. Call 1-888-766-3020 or submit a Free Flat Roofing Quote if you have questions about flat roofing installation or any other roofing inquiries. For expert advice on deciding which roofing system will best fit your requirements, call New Roof Connecticut 1-888-766-3020. Our expert roofing contractors make your roofing project as simple as possible and deliver quality and satisfaction with every roofing project. Other roof construction services we offer in Connecticut are new roof construction, roof repairs, re-roofing, roof renovation, retrofitting, remodeling, preventative maintenance, roof leak repair, waterproofing, flat roofing, metal roofing, tin roofing, metal roofing, copper roofing, asphalt roofing, roof flat, rubber roofing, flat roofing repair, EPDM roofing, PVC roofing, Thermoset Membrane roofing, Thermoplastic Membrane roofing, Modified Bitumen Membrane roofing, commercial roofing repairs, roofing shingle, roof truss, roof insulation, roof cladding, and timber cladding. New Roof Connecticut has the solution to all your roofing needs so request a Free Commercial Roofing Quote today or call 1-888-766-3020.